Part linguistics report, part memoir, Monteverde is a story about the clash of cultures and the bonds of language, and you’ll want to read it in one sitting (like I did). 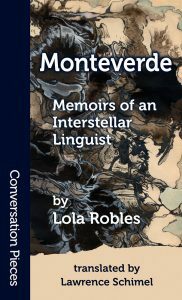 Robles expertly mixes notes that Terran linguist Rachel Monteverde took for her report to the Society for the Study of Interstellar Languages with Rachel’s reminiscences about life on Aanuk and the ways in which language acts as the common denominator among otherwise wildly distinct cultures. At its heart, this is a story about translation’s importance in breaking down barriers between people, and Lawrence Schimel’s translation of this story about translation is so smooth you almost forget that Monteverde wasn’t originally written in English. During her stay on Aanuk, Rachel learns about the differences between the two distinct populations: the Aanukiens (whose ancestors were from Earth) and the Fihdia. While the former foreground pleasure, freedom, and aesthetics, the latter (all of whom are blind and live in caves) emphasize religion and logic. Their differences couldn’t be more stark: one loves color while the other cultivates sound, scent, and touch; one encourages its citizens to travel and gain new experiences, while the other remains mostly confined to their area of the planet. Not surprisingly, each seriously dislikes the other. To Rachel, translation is the key to eliminating years of animosity and misunderstanding, and her exposure to both Annukien and Imu (Gutia, another Fihdian language, is used solely to communicate with their divinity), allows her to see past their differences. For this interstellar linguist, the constant of language is what makes it possible for alien cultures to approach one another: at one point, she explains that our very reality is formed from language. Rachel further explores how the circumstances of each group’s physiological characteristics have influenced the development of their respective languages: the Annukiens rely on words for color, for instance, to describe their world, while the Fihdia describe objects according to their textures and events in terms of smells and sounds. From such differences sprang the distinct cultural traditions of each group and the animosity that keeps them mostly separate. While she learns these languages and gains some understanding of the two peoples, Rachel learns about how some Annukien’s trips to Earth and other planets has made them dissatisfied with their “backward,” isolated planet. Despite these travelers bringing back new technology and introducing a sedentary lifestyle, such things simply didn’t fit into the Annukien lifestyle and were rejected, thus leaving these travelers frustrated and disappointed. Such experiences make Rachel understand just how much Annukiens emphasize pleasure and happiness, in order to banish such feelings as disappointment and regret. As if in response to this experience of exile on one’s own planet, Rachel’s pregnancy by an Annukien functions as the first step in true cross-cultural communication and integration (between Annukiens and Terrans). Monteverde is unlike anything else you’ll read this year. It raises language itself to the level of a main character, one who may be invisible but nonetheless forms the basis of all interaction and understanding. Without language, we wouldn’t have Monteverde, and without translation, us English-language readers wouldn’t have access to this small but brilliant book. Thank goodness for translators!